Ashley J George | AD-ventures of a Creative: A week before Christmas and all through the office . . .
A week before Christmas and all through the office . . .
All the creatives are stirring during the winter solstice. The stockings weren't hung by the chimney with care, because then all our feet would be cold and bare. While everyone is nestled all snug in their beds, we're up designing all the ideas from our heads. I'm in a hoodie and Sheena in her wrap, we settle down to concept with my dog in my lap. When out on the lawn there arose such a clatter, I sprang from my desk to see what was the matter. Away to the window I flew like a flash, rolled up the ikea blinds and threw open the hatch. The moon up high, shining aglow, gave a mid-day luster to the objects below. When, what to my wondering eyes should appear, but a regular sized shopping cart and eight cans of beer. 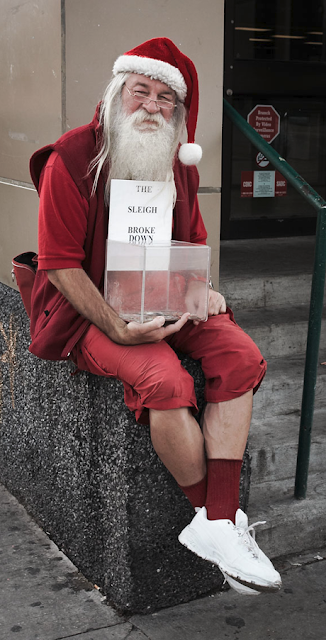 With a little old driver, not so lively or quick, I knew in a moment it wasn't St. Nick. Our last client presentation of the year is tomorrow! Kind of exciting, I am ready to get home and spend a week with my boys. I have learned a lot in the last year (well really the last 6 months) and as I look back there are things I am proud of and a few that I'm not. Each of which was a learning experience. I am looking forward to a new year of growth and learning. I have added a couple new mentors to my arsenal and continue to set the bar higher for myself, sometimes not by choice. In the end, I know what I am capable of and I will continue to roll up the sleeves and get it done. Advertising is a crazy lifestyle and I don't know if I would trade it for any other. If you are still trying to get into the industry, let's chat, I have a new project in mind that you might be able to be a part of.